Gluten Free Chocolate Bourbon Pecan Pie | Clare Cooks! Posted on December 9, 2011 by Clare Cooks! I decided to try a new pecan pie recipe this year. 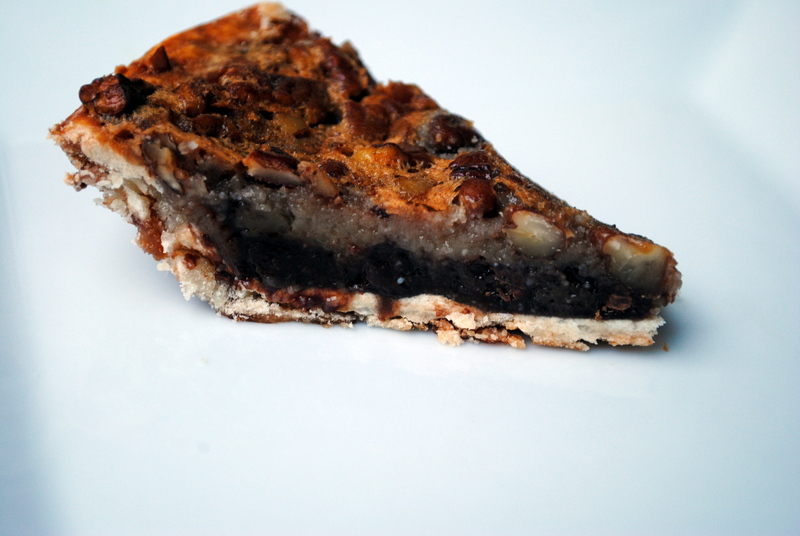 Pecan pie is one of the few desserts I like once a year, but I’m still pretty picky about it. The chocolate and bourbon definitely puts this pie over the top. 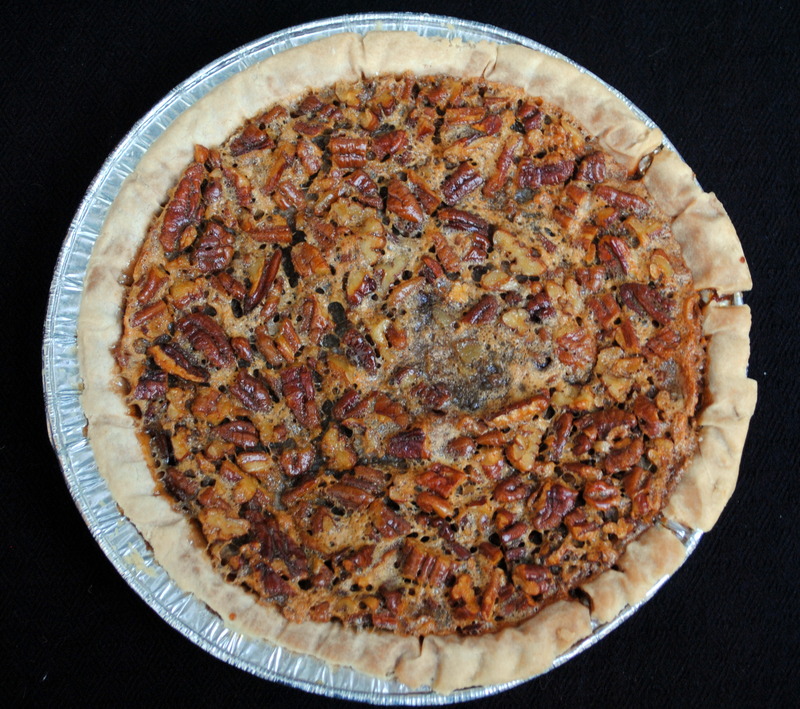 I would highly recommend it if you are looking for a twist on regular pecan pie. I read through the comments on the recipe after I made it and I definitely wish I had read them before. This pie makes a TON of filling. You will need a deep dish or 2 regular crusts (see my note!). I would also agree with the recommendation to cut down on the sugar to 3/4 cup. I personally didn’t find the need to cut down on the chocolate or bourbon (and this is coming from someone who is not a fan of chocolate or bourbon), however some other bakers did, but I mean, pecan pie is supposed to be decadent, why cut down on the chocolate and bourbon…? NOTE: The original recipe called for 1 9-inch pie crust. I followed the recipe exactly and ended up with enough filling for 2 8-inch pie crusts… I would definitely recommend using a deep dish crust or 2 pie crusts like I did. I decided to cheat and used pre-made gluten free pie crusts from Kinnikinnick. These pre-made pie crusts were really not worth the hassle. This is the first bad experience I have had with a Kinnikinnick product. I’ve had good experiences with Whole Foods GF Pie Crusts in the past, but didn’t have a chance to get to WF before I needed the crusts. In the future I will still to Whole Foods Pie crusts or just use GF graham cracker crumbs. In a small saucepan combine sugar, corn syrup, and butter or margarine. Cook over medium heat, stirring constantly, until butter or margarine melts and sugar dissolves. Cool slightly. In a large bowl combine eggs, bourbon, vanilla, and salt. Mix well. Slowly pour sugar mixture into egg mixture, whisking constantly. Stir in chocolate chips and pecans. Pour mixture into pie shell. Bake in preheated oven for 50 to 55 minutes, or until set and golden. May be served warm or chilled. What brand and where do you find gluten free crust? I used kinnikinnick’s gf pie crust, but honestly, I would not recommend it. It didn’t bake right, it burnt after, it broke, it was a mess. I’ve had the best luck with Whole Foods’ gf pie crust or making my own even though it takes a million years. Pingback: Sunday Summary: December 11, 2011 | Clare Cooks!